Through a blurry neon haze of the 80s comes a gritty drama that has taken over a decade to make its New York debut. Written by Octavio Solis and presented by Boundless Theatre Company, a designer driven company, Prospect takes some drug and alcohol induced people, stirs in some problems, and pours out a mix of drama with little intrigue. Presented at the confusingly multi-named venue currently billed as Teatro Circulo, Prospect follows a quartet of personas whose problems and insecurities intertwine in forced fashion to examine regret. The play begins with a chance meeting between crimped queen Liza and nerdy and wasted Scout. As the drinks flow, Liza's lover Vince finally arrives and convinces Scout to come home with he and Liza. Upon arrival they meet Elena, Vince's cancer ridden, couch bound wife. As poor blunts of medicinal marijuana are rolled and insults are slung, the evening takes a turn as truths are unveiled. Since the text has been kicking around for years, there's little need to comment on the desire and ambition to be a Sam Shepard play masqueraded as an edgy neon-soaked catastrophe. Instead, it's more important to tackle how director Elena Araoz and the designers approached the production. To start, this is not a character driven play. It's all about story. Araoz tried to infuse some depth but rather than focus on character, we watched as drinks and pot were consumed to mask the problems. These are severely broken and damaged individuals but with the tone and style set forth, it's hard to care about their needs. This is a production that prides the wonders of design but when you're left pondering the text and characters, a beautiful design will fall in the wayside. Boundless Theatre Company should be proud of the beauty that they created. But did it serve the text best? 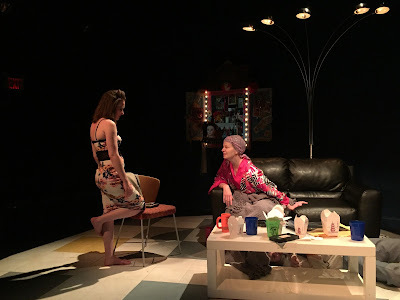 The set from resident scenic designer Jorge Dieppa served the purpose of allowing two locations in one by simply eliminating props and some of the neon and fantastic table light by resident lighting designer Maria Cristina Fuste. Dieppa's design was jagged and called attention to unsettling angles. But those angles and the bits of blank space next to the tile floor hurt Araoz's staging. With the three-quarter thrust seating alignment, those sitting on the house left risers likely missed essential moments as the company's backs were to them. Though straight on isn't as interesting, it would have allowed less bad seats than this current arrangement. That aside, the moments when the action bled onto the black space felt like mistakes. Araoz had little room to have her company go and by stepping off of the tiles, it hurt the vision. One interesting choice Dieppa made was painting the back wall a deep blue. While it did blend in well, you have to wonder why not just keep it black? When it came to the lights, Fuste destroyed reality. The images and colors were striking. And the use of neon was perfect. Because the space of a thousand names doesn't really have strong entrance and exit places, Araoz utilized the back hall door. If you can get past the noise of the door, the pink hall light Fuste added was a brilliant touch. When it came to costumes, they were strong in era while not feeling too bold and comical. Resident costume designer Sarita Fellows paid great attention to pattern and color giving each their own to live in. Sound designer Nathan Leigh explored the atmospheric approach, especially in the club scenes. It blended into the scene without ever feeling overbearing. The play focused on a quartet of personalities. As single contact ridden computer programmer Scout, Oscar Cabrera brought out the paranoid geeky personality. He stuck out yet faded royally in comparison to the over-the-top characters aside him. As the woman stuck in regret, Keira Keeley shined as Liza. She managed to craft a character that is bold yet believable. The character of Vince is a bit shady until the truths are revealed. It’s a tale of two personalities. Wild and crazy with Liza. Whipped and submissive with Elena. Unfortunately, Cliff Rivera had incredible trouble balancing the two cohesively. Rivera’s Vince was cartoonish and a bit of a distraction. Elena is by far the most fascinating character Octavio Solis has written in Prospect. She’s a fiery volcano of a woman. Monica Steuer brought the ferocity. Once she appeared, she dominated the stage. Whether it was storytelling or baffling performance, the presence of Winter and Red never felt fully realized. Yes, they were a source of conflict but Terrell Donnell Sledge and Danielle Skraastad as Winter and Red respectively literally felt like party crashers. No matter how you slice it, Boundless Theatre Company’s Prospect felt like a secret scene from a live action Grand Theft Auto: Vice City. Prospect featured designers proficient in their craft but the selection and subsequent vision of the production was lost in translation.